The road from the French INSEP academy led Evan Fournier to the Orlando Magic in the National Basketball Association. The man grew up in the suburbs of Paris and now holds a lucrative contract in the biggest basketball league in the world. Let’s learn more about him, shall we? Everyone finds their own path into their passion through several means. It could be through a happenstance or something that was forced on you. For Fournier, who was born on the 29th of October, 1992 in a suburb outside of Paris, his passion was a result of watching the 2001-02 Sacramento Kings play. It was a love that started out of one game against the LA Lakers in the Conference finals but it was one that followed Fournier into his adulthood, so much in fact that he wears the number 10 jersey in honor of Mike Bibby, who was a Sacramento King at the time. Humble beginnings make for good stories, they help the world aspire to greatness. Fournier’s professional beginnings is a humble one. Starting from the French INSEP academy as a young boy with a dream of joining the French second division team, JSF Nanterre; Evan rose to the summit of French Professional Basketball after signing a two-year deal with the Poitiers Basket 86, and then capping it off with a draft pick in 2012 NBA draft. Indeed, his journey from a boy who fell in love with basketball in the suburbs of Paris to the NBA is inspiring. Fournier Evans may have begun living the dream of many after getting signed to the Denver Nuggets in 2012, but his professional career did not start off with a fairytale. He spent most of his time on the bench. 73 games into Fournier’s first season at the Nuggets, he was a part of just 29 of them. Things however started taking a turn for Fournier towards the end of the season. He started getting a run in the team, starting the Nuggets last three games. When a player gets an opportunity like this, especially after a long run of being shut out, it is always best to take advantage of it. Well, Fournier did. Returning the faith in him by recording an average of 12.3 points in his late run to the end of the season. Having shown towards the end of the 2012-13 season that he had something to offer, Fournier was given another chance to prove he wasn’t a fluke. The Saint-Maurice born shooting guard was part of the Nuggets team for the 2013 NBA Summer League and it was a decision that bore fruit. The Nuggets, sensing that his run was not a flash in a pan, extended his contract so he could play for them in the 2014-15 season. It didn’t take long for the decision to be rewarded with Evans delivering what was at the time, his career best scoring performance by recording 27 points against the Sacramento Kings. A growing reputation and perhaps the need to be in a more efficient team, among other reasons, caused the Nuggets to trade Fournier to the Orlando Magic. Not one to let an opportunity pass, the Magic quickly took advantage of the fourth year team option in his contract, guaranteeing he would be their player through the 2015-16 season. Fournier was a talent on the rise and so were his records. In his first season with the Magics, he broke his personal best scoring record and followed it up in the second season with a season-long scoring performance that saw him lead his team in scoring 19 times. His performances made the Orlando Magic resign him to a five year $85 million contract. In the 2016 season, Fournier continued his habit of delivering for his beloved team. On 3 November 2016, he delivered a season-high 29 points performance against the Sacramento Kings. On 16 January 2018, Fournier scored a career-high 32 points in a win over the Minnesota Timberwolves. He sprained his left medial collateral ligament on March 7, 2018, in a match against the Lakers and was subsequently ruled out for a period of time. Having started his NBA career in 2012, this bloke secured his first major professional contract as a five year, $85 million deal. However, Evan Fournier’s net worth is still a bit on the low side compared to other NBA stars. He is considered to be worth only $4.2 million with a yearly salary of $17 million. He is the second best-paid player on the Magic roster. 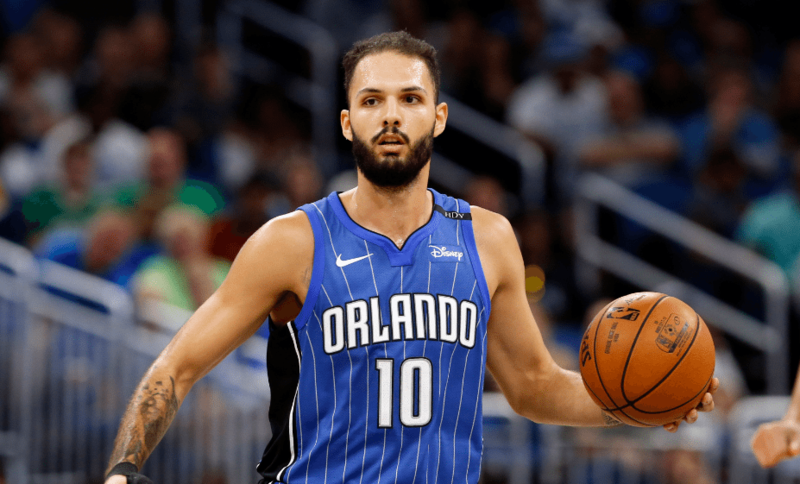 Unlike his career and the things he has attained thereof, hardly can anyone tell anything about Evan Fournier’s family life apart from the facts that he was born and raised in Saint-Maurice, France. Evan Fournier is yet to have a wife as at the time of this writing and to the best of our knowledge, his family life revolves around his parents, Meriem and Francois Fournier who were once Judo athletes. While his mom Meriem is currently a Judo teacher, his dad is one of the staff of INSPE (National Institute of Sport, expertise, and performance). The Orlando Magic French shooting guard is 6 feet 7 inches tall and weighs 93 kg.